Innovation is increasingly seen as one method of improving upon the economic fundamentals within industries. As businesses develop new products and services they become more competitive and able to succeed in a highly competitive global environment. Research by Artic (2013) helps shed light on the potential for open innovation and economic improvement of the hard hit hotel industry in Slovenia. Their findings highlight potential uses of open innovation in meeting customer needs and expectations. The author separates innovative societies from non-innovative societies. Innovative societies are those that seek to enhance their markets by developing new products and services that in turn can influence jobs and economics. Routine societies try and maintain existing systems without creative destruction whereby economic growth become stagnant. Stagnation means eventual decline as other countries zoom to fill market gaps. Open innovation is defined by Chesbrough (2003, pg. 12) as, “a model that assumes that companies can improve their business to use external and internal ideas, and the internal and external paths to market, which will contribute to their development”. This process occurs when participants, whether corporate or individual, brings forward ideas and technology to increase the value added nature of products/services. These improved products/services make companies more competitive in the global marketplace. According to Sloane (2011), open innovation reduces costs, improves productivity, generates innovative ideas and reduces the time it takes to put new products on the market. In the hotel industry, open innovation solicits ideas from both customers as well as other industry stakeholders to improve upon the overall development of the industry. The ideas and suggestions are used to develop better services and service management to raise the value of the hotel experience. The author contends that open innovation seeks to foster synergy of stakeholders, resources, and competitive advantage. Stakeholders are seen as suppliers, related businesses, inventors, etc. while resources are generally seen as knowledge and information. Competitive advantage is fostered as new products and services hit the market at a faster rate thereby maximizing profits. The researcher used 35 Slovenian hotels in an attempt to understand the hotels understandings of their demographics, the macroeconomic environment and open innovation. The found that 63% of participants believe that entrepreneurship and globalization dictate trends of development, 75% that innovation is a major developmental force and 75% believe that it will be even more important in the future to understand the needs of guests. 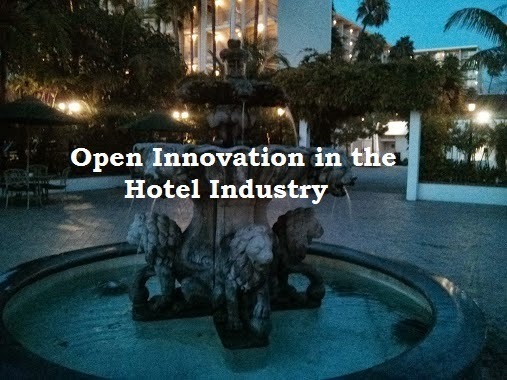 Only 38% of hotel administrators heard of the concept of open innovation but more than half were sure they were using it. The author’s study focused on open innovation awareness and use in the Slovenian hotel industry. The study was limited to customers alone. There are other factors of open innovation which could include cross-industry use for major product/service development, supplier collaboration for transactional efficiency, governmental usage for community building in addition to customer usage. The study does highlight how open innovation can increase the competitive stance of companies by encouraging new product/service development as well as reduce time to bring those products/services to market. Artic, N. (2013). Open innovation as a chance to overcome economic crisis in hotel industry. Tourism in South East Europe, 2. Chesbrough, H. (2003). The era of open innovation. MIT Sloan Management Review, 44 (3). pp. 35-41. Sloane, P. (2011). The brave new world of open innovation. Strategic Direction, 27 (5), pp. 3-4.